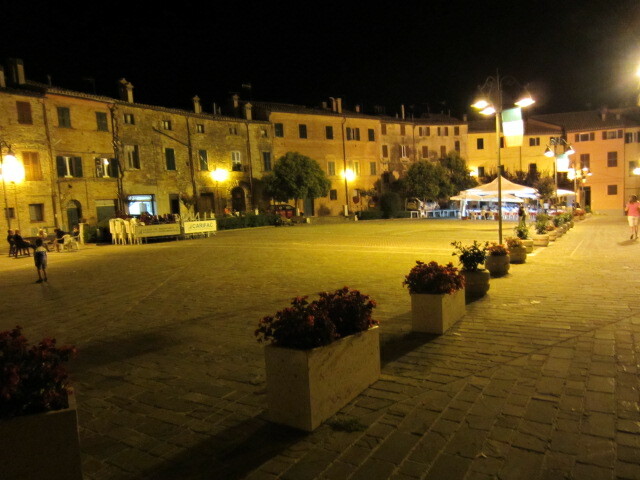 Eating out in Cupramontana gives you Gina’s, a pizza restaurant, Rosina’s a few miles out of town with a glorious terrace overlooking the surrounding hills & Ristorante La Orietta within the medieval, walled core of the town. 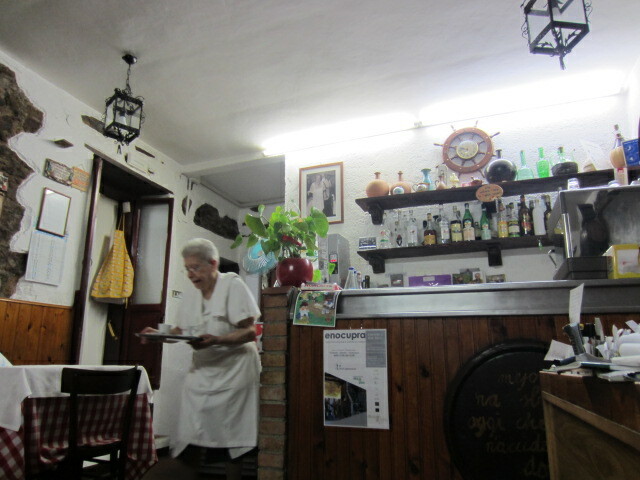 But I must spend some time telling you about the special delights of eating in Trattoria Anita. 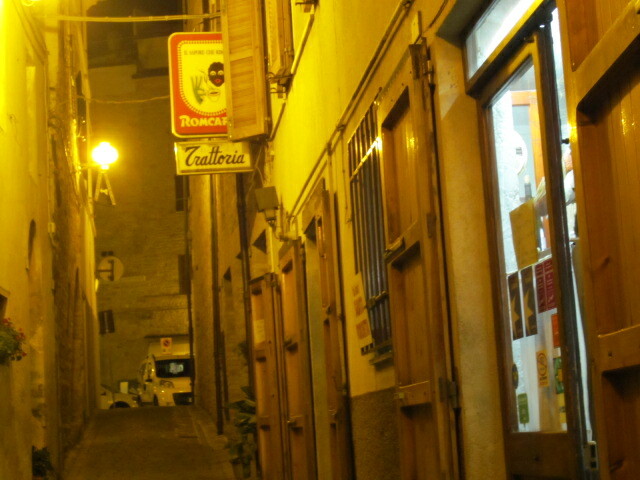 This can be found down a narrow, dark, cobbled street beside the butchers, under a totally inappropriate sign showing a golywog drinking a cup of coffee. 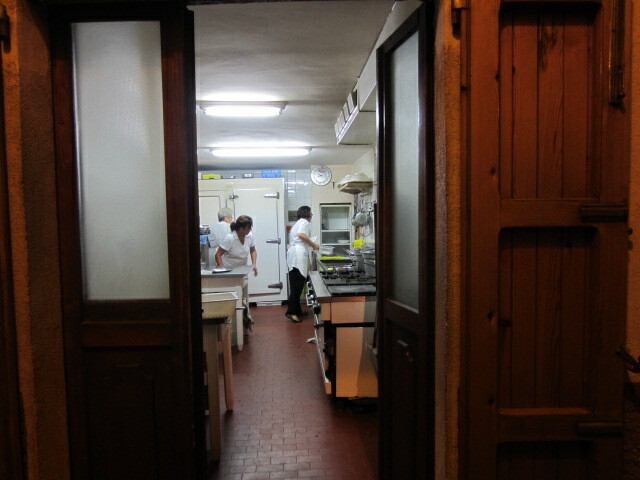 The first doorway is into the kitchen of open charcoal grills and steaming, aluminium pots & pans where three elderly, hunched mamas pirouette around each other in the space in the middle. The second door is the entrance to a time capsule taking you back 70 years when it was OK to have signs like that hanging above your door. Four tables, covered in white tablecloths, covering red gingham, are positioned on each side of the narrow space, a counter, behind which are shelves of ancient, crusty bottles containing different coloured spirits, faces the entrance, a doorway that leads into the kitchen and a fridge unit holding two types of wine-white in loosely corked bottles and red in those old Corona clasped 1litre jobbies, about 20 of each. Yes, we can eat. Papa, aged about 75, appears and shows us to a table. A bottle of gassed water and a bottle of white is dumped on the table. There follows 5 minutes of sign language with papa grumbling away in discontent, where we exchange these for still water(we get a bottle of tap, so we keep the fizzy) and a litre bottle of home-produced red, which is surprisingly good and has gone by the end of the evening. 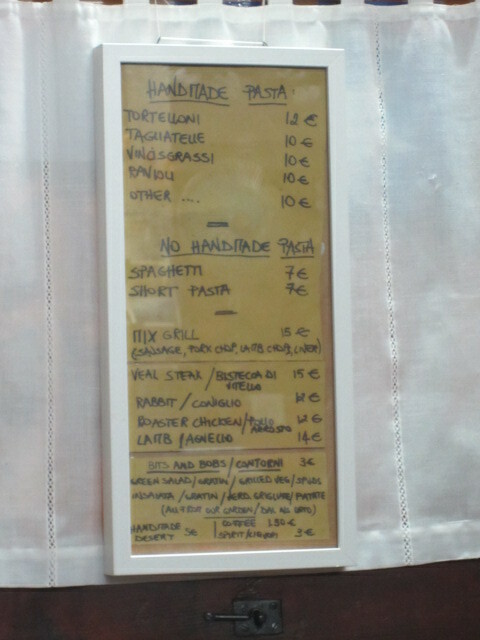 No menu is immediately obvious. A 4th, younger lady, by that I mean later 40’s, who also speaks only Italian, appears at the table and gabbles through the premier platas. Recognising tortellini and ravioli we choose the former. Papa comes out of the kitchen with a tray of small curled pasta, covered in cream and parmesan and filled with cheese and bacon pieces, he serves us and retires, mumbling about something or other. The food is absolutely delicious. Meanwhile the room is starting to fill up. 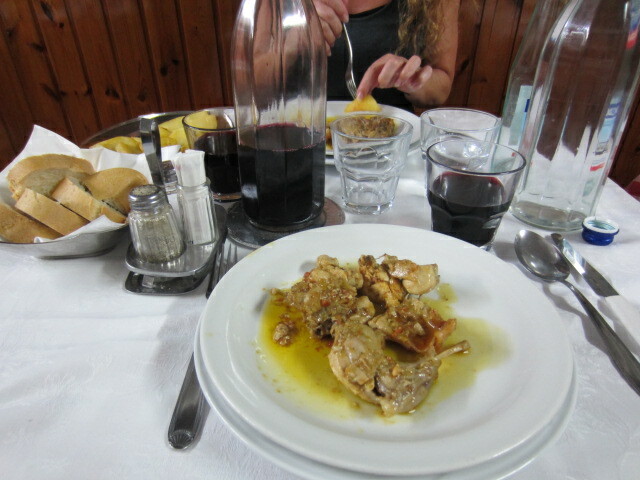 Local Italian families take the tables in the room and get the same food as us. But hey, they keep coming. Two police officers, with guns, mother and child, pairs, threes, larger groups know their way to the hidden door which leads, via a single pointing finger to ‘upstairs’. Papa has a problem. He appears with a piece of cotton wool protruding from a nostril, which doesn’t look good. As he returns from the door and showing some people upstairs, he gestures and the plug falls, to land, much to the surprise of the customers, on the table in front of him. They accept this invasion of their space and carry on eating as papa returns to the kitchen, never to be seen again. His serving duties are taken over by mama. Mama is stooped with age yet skips around the joint, involved with everything. 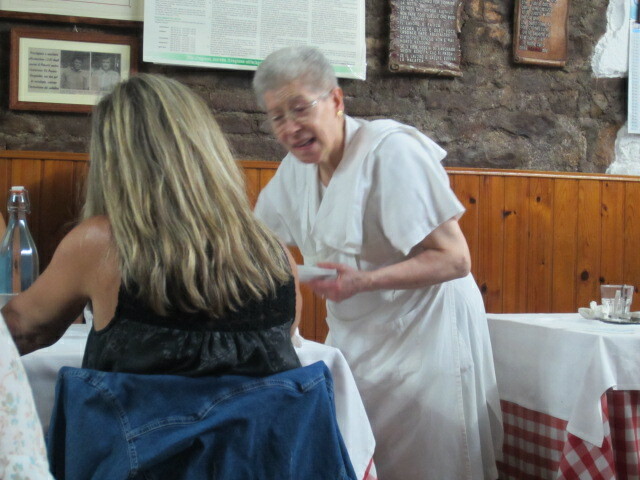 She explains, in a high, fluttery voice, the meats that are available for the secondi. Acorn Antiques comes to mind. She is lovely, breaking into a huge smile when ever a dish is complemented. 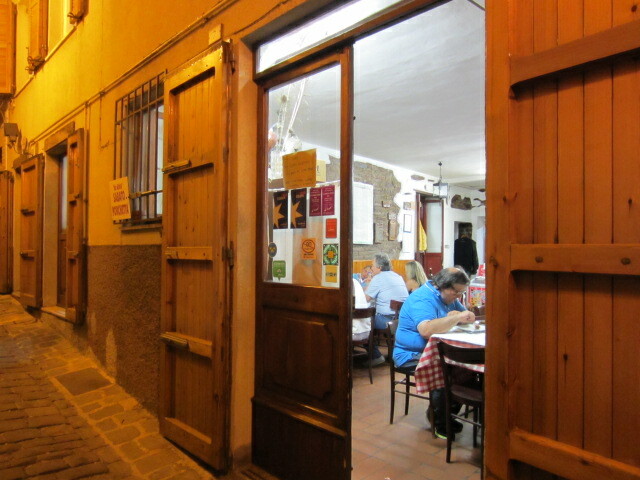 We spot the only menu, a hand written poster on the inside of the door, which helps us choose the rabbit (and that is what you get, cooked in oil, garlic & tomato-delicious) from the 4 available, all served with pots or tom gratin. Dessert is the only slightly disappointing element of this wonderful, home-cooking experience so I’ll gloss over that as I don’t want to leave on a sour note. Coffee was great and the bill ever greater. This was a true family meal, cooked by the family, served by the family and prepared by the family, for locals. If you are ever nearby this is so worth the effort. Thank you mama.